Jesus explains that, "No one shall even be able to enter the kingdom of heaven unless he becomes like a little child." EAVING THE NORTH country near Caesarea Philippi, Jesus and his twelve disciples journeyed back to Capernaum. As they went Jesus talked with them again about the sufferings that would soon come upon him. He even told them that he should be killed and that on the third day he would rise. But they could not understand. Soon the disciples fell to disputing among themselves which should be the greatest in the kingdom of heaven. They still believed that Jesus would set up an earthly kingdom and that they should hold positions of honor in that kingdom. But as they disputed among themselves they said nothing to Jesus about the matter, not until after they had reached Capernaum. Now, Jesus did not wish to attract the crowds which flocked to hear him teach in other days, so he went with his disciples into a house, and few people knew about his stopping-place. But while they were in Capernaum a man who collected tax money for the temple in Jerusalem saw Simon Peter and asked whether his master paid the tax, which every Jew was supposed to pay. Peter replied that Jesus did. When he returned to the house where they were staying, Jesus sent him to the seashore with a line and hook and told him to look in the mouth of the first fish he should draw out of the water. "You will find a piece of money with which to pay your tax and mine," said Jesus. Peter obeyed, and found the piece of money in the fish's mouth, just as Jesus had said. With it he paid the tax to the collector, and returned again to the house where Jesus was. When all the disciples were come together in the house, Jesus asked them what they had been disputing about on the way to Capernaum. They were ashamed to tell; but Jesus knew their thoughts and he knew, too, what they had said to one another as they walked along the dusty road leading from Caesarea Philippi. 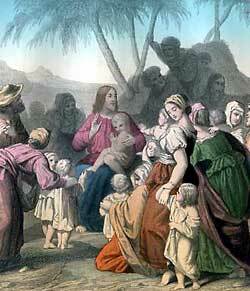 So he called a little child and set him in the midst of the group. Then he took the child in his arms and said, "No one shall even be able to enter the kingdom of heaven unless he becomes like a little child. And whoever humbles himself as this little child is willing to do shall be the greatest in the kingdom of heaven." Jesus then told the disciples to be careful not to despise little children, for their angels in heaven always look upon the face of God. And he warned them to be careful lest they cause some child to lose faith in him, for he said, "It is not the will of your Father who is in heaven that one of these little children should lose faith in me and die in sin." One of the disciples, named John, then spoke to Jesus and told him that they had seen a man who was not a follower with them casting out evil spirits in Jesus' name. "We forbade him to cast out evil spirits any more in your name, because he would not follow with us," said John. Jesus replied, "You should not have done so; for whoever performs a miracle in my name is helping me in my great work, although he does not walk with us."